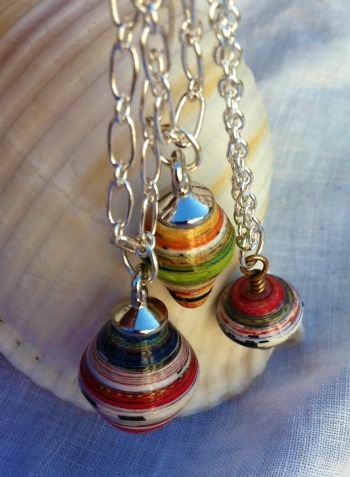 Introducing………Azine Pendants – a totally cool pendant that can be worn by itself or as many as you want! I call them Azine because they are one hundred percent from the pages of a magazine. This Holiday Season, it is not only eco – nomical to make your own presents but you are also giving the gift of green. It is a gift that will be definitely well received! Hi Linda, The bamboo roller might work for you. I have the metal and the bamboo. For items that need a larger more consistent hole I use the bamboo. The hole is not too big for most things. Or you could use a straw if the hole has to be really big and then cut the straw to the size of your bead after rolling it . For my smaller holes I use the metal roller or a toothpick. I hope that this helps and happy beading! I am having trouble with the holes. They are either too small or too large, so I can’t get the rope through the hole or if the hole is too large it doesn’t look good. I have tried pencils tooth picks and other form of to roll the paper. What I need is something in between. Any ideas? I have found many website on paper beads but your has been the most helpful. Thank you once more. I am disable and it helps to have a website what I can turn to and not get frustrated with. wow …!!! very nice these “azine”! to adopt without delay …. or to offer in simplicity! and always these wonderful colors of magazine paper …I love them !